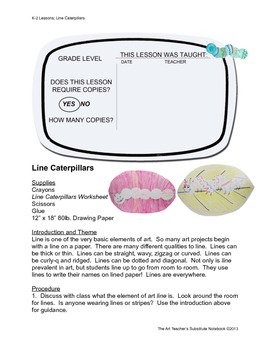 This notebook provides 12 complete curriculum appropriate lessons designed to be taught by anyone without an art education background. The Art Teacher’s Substitute Notebook: K-2 Lessons includes lessons based on the themes of identity, and architecture. The elements of line, shape, and color. The principles of balance, emphasis, and pattern, basic shape drawing, the parts of composition, AND MORE! Twelve complete lessons include eight ready to pass out worksheets, two ready to pass out handouts, and peace of mind! We’ve all had terrible substitutes enter our elementary art room and destroy it. Not following plans, using special supplies, or letting kids run wild. Even substitute teachers with good intentions can often wreak havoc on an art room, or be scared to teach the prepared lesson.. 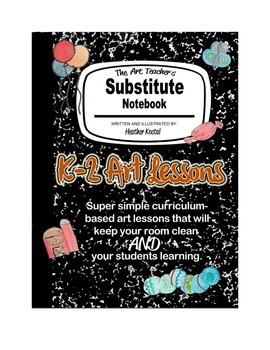 The Art Teacher’s Substitute Notebook: K-2 Lessons, combined with The Art Teacher’s Substitute Notebook: The Basics will benefit your sub, your students, and you. I’ve been developing this notebook for over six years. I’ve left these lessons for subs, and even taught them myself. 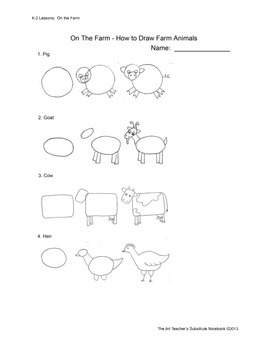 They have been proven to be simple to teach and educational. Substitutes will not be afraid to teach art anymore! 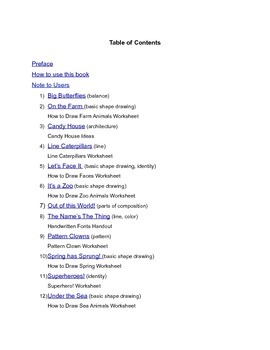 The lessons in The Art Teacher's Substitute Notebook: K-2 Lessons would also be great for home schools and classroom teachers who need to add art to their curriculum!